DOGGIE'S DOING A COMEDY TURN! : WELCOME CEDRIC! Last time my paws touched Joolsy’s Apple Mac computer I mentioned two things. Firstly playing hide and seek. Well I am pleased to announce that I Marble doglet have the highly trained bearings of an SAS Commando. I sniffed out where my Joolsy was the next day with absolutely no problems whatsoever. No sat-nav required on my watch! Then secondly I typed about the “family” as they put it so eloquently in Eastenders looking at other animals online and around the nearby Pets At Home stores. Well I’m pleased (Joolsy has a gun to my head, better call my SAS pals or Ross Kemp to put her in an arm lock here) to announce the arrival of CEDRIC!!! 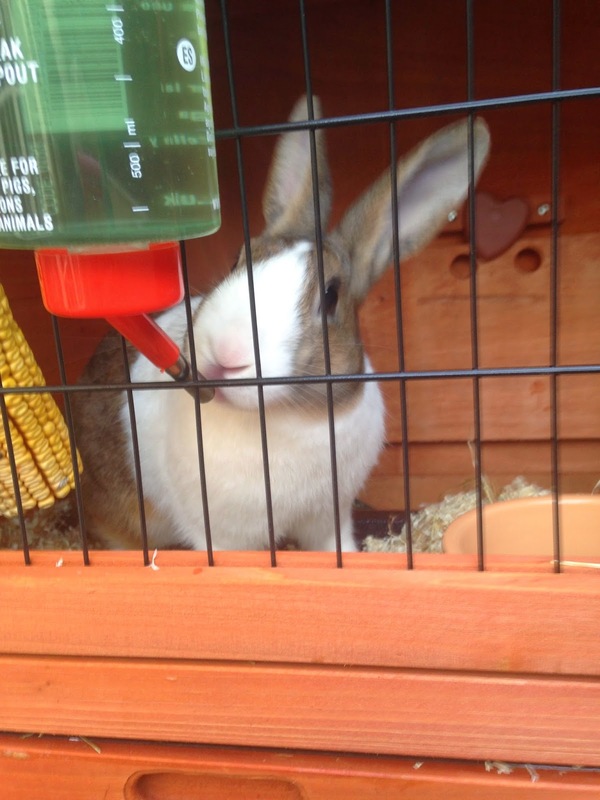 He is a Harlequin Dutch RABBIT that my brigade took pity on in Pets At Home. Cedric or Peter as he was called back in his pet shop days, was separated from all the other rabbits in the shop because he was, “troublesome with challenging behaviour”. “Jesus what has entered my world?” were the sheer and zinging thoughts flashing around my brain as Cedric was bought into my world in his blue carry box. Cedric’s hutch didn’t arrive for the first few hours that they had him home. That will be the £10 I slipped the Yodel delivery driver in the vain hope that this disruptive element might go back to the pet shop from where he came. Whilst waiting for the hutch and while I was out for some well earned Marble and Dad male bonding time, okay my walk, Mum decided to let Cedric out for a WALK of his own around the hallway. Cedric had other ideas about this walk about and became extremely bouncy indeed! First he bounced at the back door and up at the glass panelling for a look at the outside world, well the yard. “Yes fella out there is where you will be living,” Mum explained Then he charged passed Mum like a steam train and went bouncing up the stairs towards Joolsy’s bedroom. Well I suppose he is fairly smart to have found where Joolsy sleeps so quickly so he gets ten points for that directional observation. Then Cedric decided to pounce, yes I did mean pounce there not bounce, straight through the banisters on to the stairs below. Not content with the horror on his Granny Dawn’s (Joolsy’s name for her) face he pounced through the next banisters on to the hall floor. This rabbit is an action hero! When Joolsy got home and his Granny Dawn told her the story she went out to the yard and had a “chat” with him all Godfather style (yeah right) about his camacasy behaviour and then told him about the opening sequence of Casino Royale and promised that one day if Mum and Dad were to take me to posh boutique hotel (in this dogs dreams, yes please!) that her and him could watch it so he could perfect his moves James Bond style! She encouraging the stunt bunny, words never cease! Finally Cedric’s hutch arrived and was assembled an hour and a half and a few screws missing later. The instructions said twenty minutes, so oh dear Dad I don’t think if Changing Rooms was ever resurrected you’d be taking over from Handy Andy. Mind you I swear they say twenty minutes as a clever marketing trick, Ikea be warned this Cocker Spaniel’s onto you! I could finally stop looking for the Gin bottle and relax in my own home and just chill on the sofa with my family and watch Corrie, he was outside! It did take a bit of getting used to Cedric been there at first. I would go and bark at the cage but to be honest with you he is so unaffected by it and I feel it could’ve been a lot worse had they gone down the other dog route that I guess sharing my yard is a happy medium. How grown up do I sound? Pets At Home however weren’t wrong when they said Cedric had a bit of a screw lose, must be from the hutch, bum bum, I’m on tip top form today! He’s also a definite member of the SAS just without the parachute. He went to the vets for the usual check-ups, injections and then a week later to have (quiet whispers here to spare Cedric's pain) “the operation” to help him calm down. That worked really well, not!!! Mind you Joolsy swears if he hadn’t have had “the operation” his behaviour may have been even worse. It would really have been Prison Break from his hutch then instead of just a darn good chewing session when he’s wanting to come out to play. Play this rabbit certainly does. I’ve seen him hurtling down the yard faster than Usain Bolt then flying up the side of the bin or at the ladder housing like an Olympic high jumper. Two sports in one rabbit, he could perhaps train for a decathlon one day. He has chewed holes in both Joolsy’s and Dad’s jeans. Joolsy’s were so bad that it was too late for even Casualty’s Connie Beauchamp to put her surgical skills into action to save them. Also he’s taken a fancy to Dad’s geranium’s, oh dear don’t tell Alan Titchmarsh! He has taken to dipping his toes into the fountain, see he is such a sports star, only for Joolsy to pull him out and give him a Mummy style telling off about the seriousness of playing in water. Joolsy has taken to been Cedric’s Mummy like a duck to water. Even yesterday she came up with the bright idea of encouraging his talents and then filming it for the world to see on YouTube. What ever next? The rabbit will be rivaling me for a go on Joolsy’s laptop! So far Joolsy has posted two videos of Cedric throwing things around the yard. If I was so violent with house hold goods such a juice carton and then a dust pan and brush I wouldn’t get to see the biscuit barrel again all day long but Cedric does it and in Joolsy’s liberal eyes it’s entertainment, creativity and art all rolled into one. I’ll get them a form for Britain Got Talent... Joolsy better not read this it’ll only give her ideas. Anyway gun to head here again, Joolsy says I’ve got to say the videos are under “Cedric Rabbit” on YouTube if you fancy a laugh. Joolsy is proper Mummsy on the videos, full on cooing and all which is entertaining enough without Cedric’s tossing talents. I’m going to get him a frying pan and some pancake mix at the ready for Shrove Tuesday next year.